"Can you please book a ticket for my friend?" my contact shouted to his colleague five thousand miles away. "She's been calling for three months now!" It was August and I had been trying to book a flight to Tolafaria, one of Siberia’s most desolate areas, since June. Siberia is full of places that are barely accessible even for locals. Tofalaria is one of them. This beautiful word refers to a small area in the Sayan Mountains west of Irkutsk. The area has three tiny settlements: Verkhnyaya (Upper) Gutara, Alygdzher and Nerkha. It is the only place in Russia inhabited by the Tofa (or the Tofalars), a small indigenous nation with a population of about 700. Located 370 miles from Irkutsk, Tofalaria is covered with impassible taiga stretching over 8,000 square miles. You can't take a train or a bus here, as only off-road vehicles can make their way across this terrain. Alternatively, a small AN-2 helicopter can take you to the villages, but it flies only four times a month when the weather cooperates and with no more than 20 passengers on board. It is incredibly difficult to get a ticket, as priority is given to locals. It took me about 30 minutes to walk around the village of Verkhnyaya Gutara. Small wooden cottages, a school, an administrative building, two shops and a post office are surrounded by thick taiga and sky-high mountains where you shouldn't wander on your own. There are wild bears. The locals are poor. The shops offer grains, macaroni, sweets, tea, household goods, basic clothing and stationery. There is no fruit, as helicopter delivery is expensive; no meat, as locals are good hunters; no bread, as they bake it at home; and no mobile service – only a public payphone and a few landlines. The internet is available to just a few of the 400 residents. Before the 1917 Russian Revolution, there were no villages here, as the Tofa were nomads that moved around the taiga in small groups and engaged in reindeer breeding and hunting. In Soviet times, they were forced to settle down and give up their reindeer (they were nationalized), shamans, chums (traditional dwellings made from deer skins) and their language. As they stand in line at the shop, you can distinguish them from fellow villagers of Russian origin only by their face type and complexion – otherwise they lead the same lives. However, some Tofa are trying to hold onto past traditions. Accompanied by my guide Uncle Slava and a few reindeer, we head to a small lake in the taiga outside Verkhnyaya Gutara. It is not easy to sit up straight on an old wooden saddle, as the deer's hooves sink into the taiga moss, making their gait a bit springy, so you need to keep balancing yourself in order not to fall. 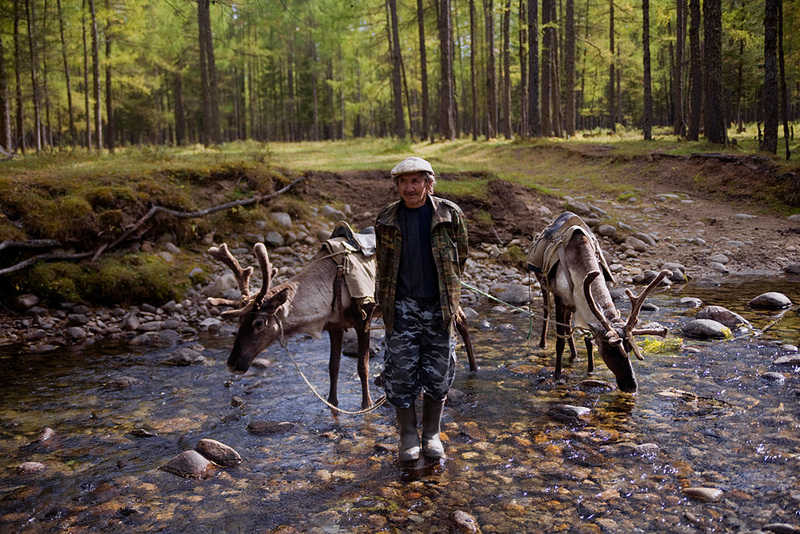 Uncle Slava and his older brother Valery have the largest herd of deer in the village – about 40 animals. They have their own pasture in the taiga. "We breed reindeer because what other choice do we have?" says Valery, who supports his wife and child with nothing but his pension. It seems that he and his brother have an intuitive inclination towards reindeer breeding, which perhaps they inherited from their ancestors. We don't say anything else, as the two men are used to keeping silent in the taiga. The reindeer graze on the moss, which is turning yellow as the fall draws near. It is very quiet in the woods. "I have always dreamed of living in the taiga,” recalls Lidia Rechkina. “It's not a whim. Rather, it’s the call of my ancestors. Our parents and grandparents spent all their lives in the taiga, and I remember how my mom and I would travel around the taiga from one herd to another when I was a kid. I really enjoyed such a life. Later, in Soviet times, we were sent to orphanages, to residential schools... Tofalars were scattered and they lost sight of their past, forgetting who they are and where they come from. I always had something to hold on to. In my dreams, I saw the taiga, my mom and her reindeer." Rechkina is sitting at a small wooden table with simple treats: A salted grayling, fresh baked bread and potatoes. Her father was Russian and her mother a Tofalar. She lives in Verkhnyaya Gutara, but spends the summer in the taiga, where her family has a plot of land with a house, a sauna, a chum (used as a summer kitchen), and even a tree stand, which becomes a shelter for hunters. Her husband Alexander also spends summers here. Originally from Moscow, he moved to Siberia almost 40 years ago. "Tofalars must keep on living in the wild, there is no other way for us to survive," says Rechkina. "In Soviet times, the Tofalar language was prohibited, and Communist activists would eavesdrop on us, lurking under our windows. Our grandparents would go to the taiga, tend to their reindeer and speak only Tofalar there. It was only in the mountains that they felt normal. I am convinced that reindeer are key to keeping the Tofa people alive. If the deer go, we go."